Fort Pulaski National Monument, a brick fortification constructed in the early 1800’s to protect the city of Savannah, was the unwitting testing ground of the first rifled cannon. Stay in a Savannah Vacation Home and wander over to River Street Sweets. Many lucky people will receive gift baskets from River Street Sweets in the coming days. Valentine’s Day means sweets for our sweeties; to those of us in Savannah, sweets means River Street Sweets. 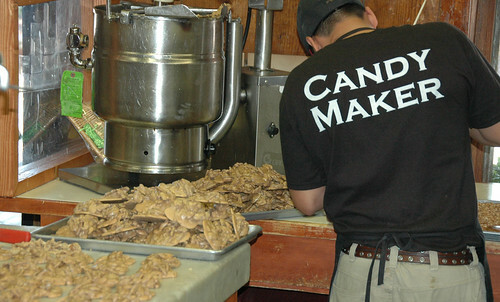 River Street Sweets originated in an old warehouse on historic River Street. It started out in 1973 as “The Cotton Bale,” a gift shop that did not sell sweets. By the end of the decade, an enormous fudge making pot was added, and shortly after that, their “World Famous Praline” recipe was born. Thus The Cotton Bale was transformed into River Street Sweets. Most people who stay in our Savannah Vacation Rentals eventually find their way to historic River Street and the original River Street Sweets store. Those who do are rewarded with free samples. The samples are a savvy marketing move, since it is practically impossible to taste one treat and not want more. Gift baskets, gift tins, gift boxes, gift towers….you can offer your love a small token of your affection, or give a veritable monument. You could place your order on line, or you could do something even better: bring your sweetheart to the store. Plan a sweet getaway in one of our Savannah Vacation Homes this February. Bring your true love to the original River Street Sweets. Indulge in pleasure, together. 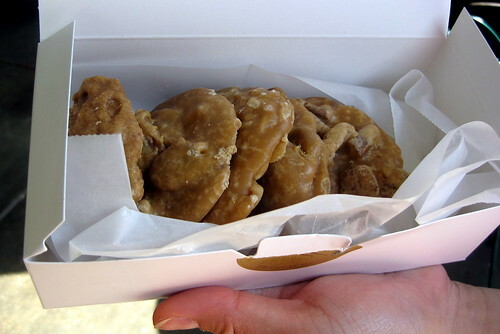 Find amazing pralines at Savannah's River Street Sweets. The first weekend of each month is a festive time in Savannah, especial along River Street. If you plan to stay at one of our Savannah GA Vacation Rentals during the first weekend of the month, plan to spend the Friday evening and Saturday along historic River Street. River Street runs along the Savannah River. A brick pedestrian path follows the river, separated from the street by large planters. East River Street is a narrow cobblestone street lined with a variety of shops and eateries. Here guests of our Savannah Vacation Rentals stock up on decadent pralines and chocolate bear claws at River Street Sweets. They find classy fedoras at the Mad Hatter and trinkets at the River Street Gallery. Shops stay open late the first Friday of the month, and patrons fill restaurants, cafes, and bars. Locals meet with friends to celebrate the week’s end, and travelers soak up the friendly atmosphere. The highlight of the evening comes at 9:30 p.m., with fireworks over the river. It’s great fun. First Friday is followed by First Saturday on the River. Between 9 a.m. and 6 p.m., historic River Street becomes a street fair. Arts and crafts booths line the waterfront, and live entertainment keeps things hopping. It’s a great place to spend the day, and it’s walking distance from our Savannah Vacation Rentals. The Savannah River is the northern border of the city of Savannah and the state of Georgia. South Carolina sits across the water. After spending an evening and a day walking the waterfront, try viewing Savannah from the river. The Savannah River Boat Cruise Company hosts dinner cruises, sightseeing cruises, and private charters – all of which are great additions to a Savannah vacation.